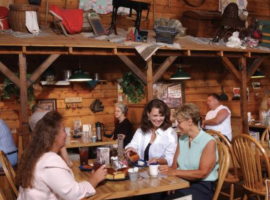 Visitors to Branson are always asking locals for their favorite places to eat. Well, we put together a list of a few of our favorites! Farmhouse Restaurant: The Farmhouse Restaurant is located in the heart of downtown Branson. This restaurant offers delicious downhome cooking and a variety of menu options that the entire family will enjoy. Check out favorites such as fried chicken, country-fried steak, and catfish. Be sure to leave room for their signature signature blackberry cobbler for dessert! McFarlains: McFarlain's is located inside Branson’s famous IMAX Entertainment Complex. This restaurant features hearty, breakfast, lunch, and dinner meals. Guests can find entrees ranging from homemade soups, salads, sandwiches, liver and onions, to chicken and steak. Make sure to try their signature Honey Cornbread, Fried Green Tomatoes, Cinnamon Rolls, and of course, their one-of-a-kind Branson Traffic Jam Pie made with cherries, strawberries, rhubarb and cranberries. Mel’s Hard Luck Diner: Mel’s Hard Luck Diner is home to Branson’s singing servers. A unique feature to this special restaurant is that your meals are served by singing servers. You’ll hear your favorite songs performed by amazing vocalists while you enjoy a delicious meal. A few of their featured menu items to check out include: homemade chicken salad, the reuben, burgers, and of course, their milkshakes! Another great resource for all of Branson’s delicious dining options is www.bransonrestaurants.com. Here you’ll find an alphabetical and categorical listing of restaurants along with numerous coupons. You can’t beat it!